Lots of women and children are inquiring more and more about going natural for many different reasons. Some may have realized that they relaxed their child’s hair too early, some may be experiencing some damage from relaxers, or some just want to be free from the relaxer. Either way it goes we are talking about a serious change to your hair and scalp that is definitely a process physically and emotionally that you have to be ready for. I have seen lots of people just stop relaxing their hair and realize that its not what they expected and put the relaxer back in – that is the worst thing you can do because you are shocking your hair. When going natural you should go to you hair care professional for a consultation (most are free), tell them that you are thinking of going natural. They should analyze your hair and scalp, take note of your natural curl pattern, determine your hair texture, density, and elasticity. All of these factors determines the details of YOUR process. Everyones process will be similar but different just as their hair. Not everyone will be able to just stop relaxing their hair they may need pretreatments especially if the hair is severely damaged, some may need to slowly back away from the relaxer by not getting it as straight as normal and just break down the curl before they can completely relieve themselves of the relaxer. I will explain why. The general process the hair goes through as it is growing out the relaxers begins with moisture treatments in all instances as you are no longer relaxing you need to make sure that you hair is ready for the change. You will notice that you have a cushion of new growth and your relaxed hair will begin to look thinner compared to your natural. The point where your new growth meets your previously relaxed hair will be THE MOST FRAGILE part of your hair strand because of the difference in texture, its called the line of demarcation. This is where you will notice the breakage during your process as you natural hair begins to release itself of the relaxed hair. Thats is why the moisture treatments are so important in this process because it will keep the hair from getting brittle which will cause it to break of quicker. We want to keep that hair on as long as possible (strictly for cosmetic purposed of course). 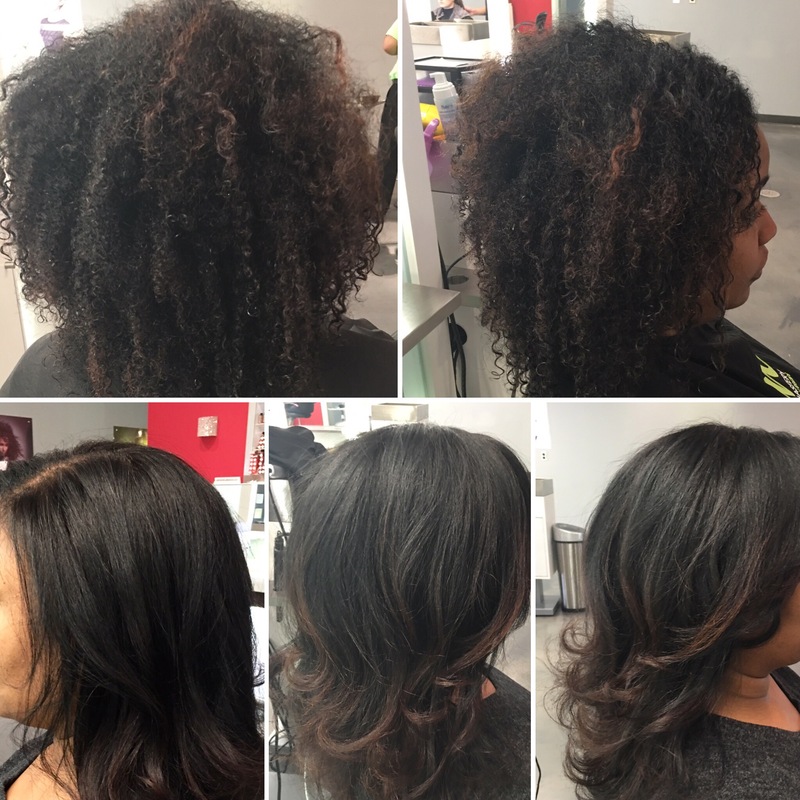 At this point is where your stylist will begin to take deeper trims (normally about 2-4 months after the last relaxer) of about 1/2” – 1” depending on the hair. This will keep your hair from looking stringy and allow it to still be able to hold curl and body. I know you are thinking : What about style? Well I recommend 2 different types of styles that are ideal for this process. Before I go into them keep in mind that the main object in styling is to try to make the texture appear as consistent as possible for a few reasons. One being you don’t want to always look like you need a relaxer (cosmetic), and if you keep the texture consistent and decrease the intensity of that line of demarcation it will decrease the breakage during styling and even daily combing and brushing. So with that being said I recommend a flat iron style professionally done because you will need to use different temperature pressures between the new growth and the previously relaxed hair. The other style category would have to be just the opposite to try to make the relaxed hair mimic the natural texture with twist sets, straw sets, braid sets, twist outs, china knots, rod sets, and other style similar where its a wet set that will not have to be combed to style just finger with a moisturizing product. These style are better if done at the salon but are safe to do at home if you are looking for something that you can do yourself, you can ask your stylist about some products that she would recommend. I know I sell product packages to my clients for them to use at home when they can’t get to me. Remember you DO NOT have to cut all your hair off to go natural, with regular visits to your stylist and increased moisture treatments, and regular deep trims, it can be a pretty good experience. At least you have an idea of what the process consist of, now you have to decide if you are ready for it. Contact your local stylist if you are ready to go through your process, or reply here if you have any questions for me. Please give me your feed back and share my blog with others.